In the years since 2000, the corridor has become more diverse than ever. In Sparks, Prater Way remains central to community life, home to apartments, stores, schools, and churches. A dynamically changing commercial district, Reno’s 4th Street continues to evolve. From steel manufacturing to furniture sales, beloved restaurants to barber shops, generations of residents continue to make this busy thoroughfare their own. The first decade of the new millennium marked a century since lumber yards, breweries, and hotels first ventured onto Reno’s East 4th Street and Nick and Celia Prater gave their name to a new housing tract in the fledgling town of Sparks. Once separated by miles of open land, 4th Street and Prater Way now formed one seamless urban corridor—continuous and yet endlessly varied. At certain times of day, some stretches can transport the viewer to another time. On a lazy curve of road midway between Reno and Sparks, a patch of distinctive neon signs still stand sentinel for the Tahoe Motel, Hi-Way 40 Motel, Sandman Motel, Farris Apartments, and Everybody’s Inn. Neon restorer and collector Will Durham keeps a close eye to make sure they do not disappear. Further east, Deer Park holds memories of generations of ball games and swimming lessons, of its namesake deer, the clang of a hammer hitting a tent stake, and hours spent lying on the grass, staring at the clouds. Talk of a potential renaissance along East 4th Street began as early as 2001. Leading the charge were members of Reno Sparks Business Corridor Association (RSCBA), who had banded together a few years earlier to discourage the City of Reno from establishing a homeless shelter in their struggling district. Their efforts to promote the area were bolstered by the Historic Reno Preservation Society (HRPS), which began to organize walking tours of the neighborhood in the late 1990s. 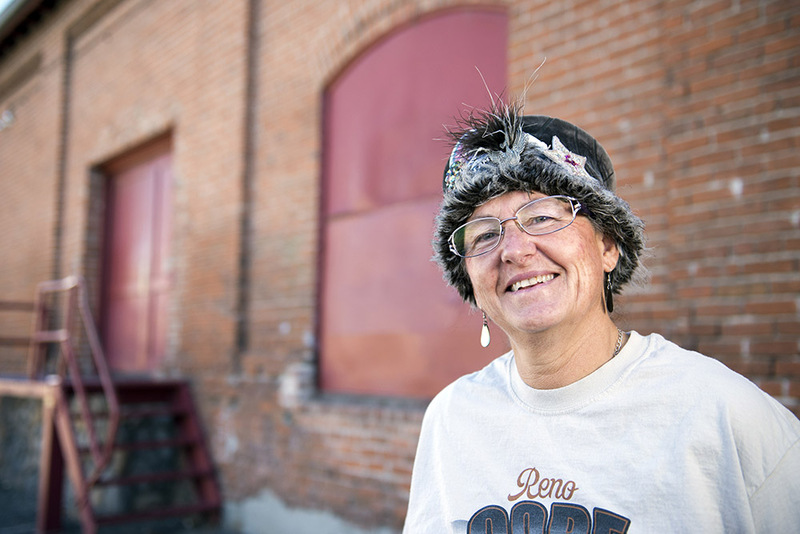 On those tours, Gaye Canepa and Cindy Ainsworth drew attention to the remarkable number of century-old buildings clustered on the eastern edge of Reno—a collection unparalleled in a city where so many others had fallen to the wrecking ball. In this new era, many of these expansive industrial buildings found new life. Forever Yours Fine Furniture, owned by Ed Scalzo, thrived in the Flanigan Warehouse, while Anchor Auctions filled the spacious IXL Laundry building with the auctioneer’s call. Stacks of stored tires towered over the aging equipment inside the Eveleth Lumber building. With the help of owner Spencer Hobson and Reno city councilman Dave Aiazzi, the Reno Brewing Company Bottling Plant became an occasional site for large-scale art projects connected to the Artown and Burning Man festivals. The energy was building. Although no longer catering to tourists, 4th Street retained its longstanding mix of spaces for work and play. Stalwarts of sparks and steel like Martin Iron Works were joined by newcomers like Tutto Ferro, helmed by Paolo Cividino. A humble row of 1930s-era buildings once occupied by welding works and heavy machinery became an entrepreneurial hub. 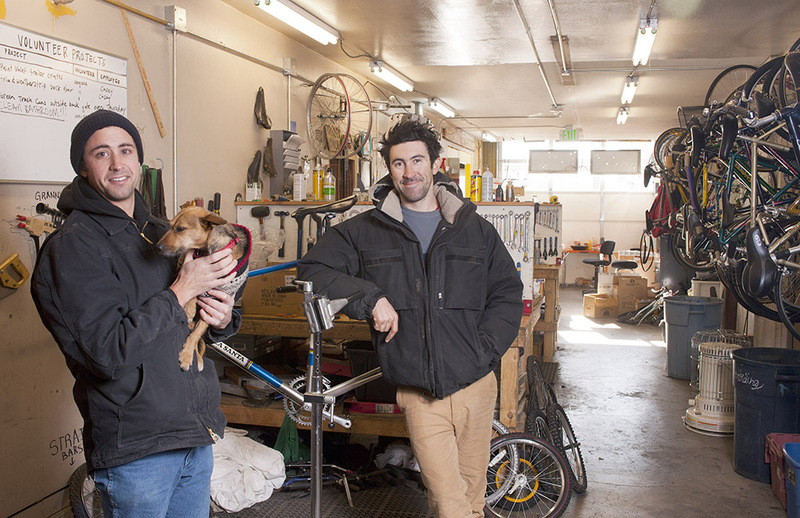 There, Remi Jourdan ran Club Underground, Noah Silverman and Kyle Kozar founded the Reno Bike Project, and Tim Conder and Casey Clark helped to create Cuddleworks, a combination bicycle messenger company, art studio, and coffee roaster in the old Allied Equipment building. A few years later, the block’s oldest building, Nevada Welding, opened as Under the Rose Brewing Company. The reinvention continued as all three of the neighborhood’s historic brick hotels left traditional room rentals behind. The first floor of the Marion Hotel became the Lincoln Lounge, while Louis’ Basque Corner, sold by founders Louis and Lorraine Erreguible, remained true to the family-style dinners and picon punch that made it famous. The Morris Hotel underwent an inspired transformation, equal parts conscientious and whimsical, into the membership-based Morris Burner Hotel. The move solidified the longstanding presence of Burning Man-related activities along East 4th Street, as described by regional contact Cari Lockett. Other investments turned some of the area’s most persistent problems into success stories. An old firehouse on Morrill Street, long recognized by the huge sculptural spider on its roof, became the sleek mixed-use 11 @ the Firehouse, where Jenny O made A Salon 7 a stylish destination. And after a decade spent quietly languishing, the Nevada-California-Oregon Railroad Depot reopened as the Depot Craft Brewery Distillery on New Year’s Eve, 2014. Amid rapid change, there was continuity, too. As they had for years, regulars sidled up to the Alturas Bar and Abby’s Highway 40. They tucked into ravioli made by Inez Casale Stempeck at Casale’s Halfway Club, and ordered “the mess” from Sally Loux at the Coney Island Bar. They bought cowboy boots from Jack and Judy Bassett at D Bar M Western Store and took their cars to Landa Muffler and Levrett Transmission. They continued to make the street a part of their lives. The latest additions to the landscape of East 4th Street occurred despite a development many had long feared would doom the district: a city-built homeless shelter. In February of 2004, the Reno city council voted to construct the new facility at the intersection of Record and 4th Streets, just four blocks east of Virginia Street. In response, the RSCBA sued the city for more than $10,000, seeking to mediate the damage to the community’s ongoing efforts for revitalization. Although successfully securing improved street lighting, a major goal, the group failed to convince the city to establish a police substation nearby. The Community Assistance Center opened in 2007, overseen at first by Homeless Services coordinator Krista Lee, and later operated by Volunteers of America and other nonprofits. Across the street, St. Vincent’s Dining Room, long managed by Ray Trevino, moved into the old Commercial Hardware building. The assemblage of services consolidated efforts to assist the city’s disadvantaged population, but led to anxieties among many others regarding the area’s safety. Although defeated in this respect, members of the RSCBA continued other improvement efforts including a “Christmas on the Corridor” event to assist children and families living in the area’s motels. Others along the corridor also worked to meet the community’s needs. Just east of the Wells Avenue overpass, developers Ann Harrington and Bob Nielsen spearheaded the Plaza on 4th Street, affordable housing units fronted by a mixed-use project. Near West 4th Street, Sharon Chamberlain and Kerry Deal steered Northern Nevada HOPES, a wide-ranging nonprofit community health center. The street remains a meeting ground for people of all backgrounds and walks of life. Meanwhile, to the east, Prater Way held its own as an established commercial thoroughfare with a wide range of affordable properties for sale and rent. By the year 2000, it had become a landscape of great diversity, both in commerce and customers. It is a street where the patterns of daily life have remained largely unchanged for decades. Today, as in previous generations, when school lets out at nearby Kate Smith Elementary, Robert H. Mitchell Elementary, and Sparks High School, the sidewalks flood with kids buying sodas, snacks, and burgers at corner stores, the Dairy Queen, or Scooper’s (the old A&W Root Beer stand). Just down the street, the Dilworth STEM Academy, described by Dean of Students Paul Gray, puts a new spin on junior high instruction. As these students make their way home, they pass through a landscape familiar to longtime residents, even if its tenants have changed. The former Safeway, with its distinctive zigzag roofline, now sells automotive parts. Hispanic-run businesses populate the Ideal Shopping Center, with the former Food Mart devoted to the Mexico Lindo Market. To the east and west, small businesses including a florist, a bridal shop, a furniture store, a laundromat, a veterinary hospital, and a tattoo shop share the road with apartment buildings, used car lots, and favorite hangouts like the Copenhagen Bar, run by Doug Quilici. An eclectic neighborhood traversed by many, it is a neighborhood and a home. In recent years, major investment along the corridor has ranged in scale from entire city blocks to new rows of street lights. In the heart of downtown Reno, the National Bowling Stadium was joined by two other major projects: the glass-faced Reno Events Center, in 2005, and the Reno Ballroom, in 2008. Each bordered 4th Street, generating bursts of activity with every scheduled event. So, too, did the Reno Aces Ballpark, located just south of the railroad tracks, in an area targeted for its own revitalization. Responsible for public transit and regional roads, the Regional Transportation Commission of Washoe County (RTC) constructed new transit stations for Reno and Sparks in quick succession: RTC CENTENNIAL PLAZA, which opened on Victorian Avenue in 2008, and RTC 4TH STREET STATION, at East 4th and Lake Streets, in 2010. In 2011, the RTC initiated plans to bring a “complete streets” approach to the entire corridor, enhancing the experience of pedestrians, bicyclists, drivers, and passengers through transit and safety improvements instilled with the area’s heritage. Built of brick and neon, concrete and steel, the 4th Street to Prater Way corridor has been made and remade, time and time again, by generations of individuals who have lived, worked, and visited there. In its contours and crevices are the stories of their innovation, commitment, joys, and perseverance. These are only some of the stories they have to tell. All we have to do is listen.